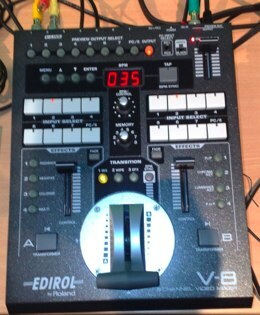 Our friend MoRpH (whose work you’ve seen previously posted to archive.org and on the intro to our VMS video) was lucky enough to get his hands on an Edirol V8 – sequel to the venerable V4 – and followed it up by being awesome enough to send us this review. A few years back Roland rocked the VJ world by giving us the first ever VJ specific video mixer, the V4. Over time, other areas such as small AV companies and churches have adopted the wonderfully small and low cost (but full featured) unit as a workhorse in many environments. But taking one look at the unit you can see it was designed for VJs. Now with the release of the V8, Roland is back to up the ante again with a feature set that builds on the success of the V4, without bogging the unit down with hidden features or a large price tag. I was lucky enough to get some hands on time with the first one to touch down in Australia recently, much to my delight. 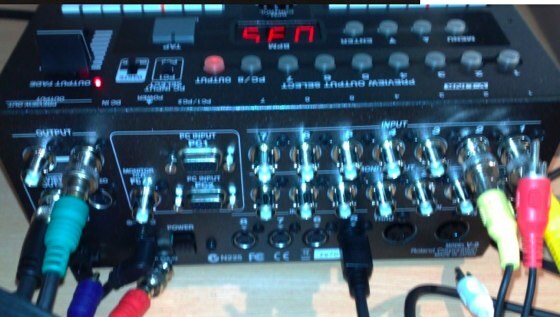 The most striking things that first hit you about the new V8 have to be the inclusion of 8 inputs (a god send on large multi source rigs) and the change to faders, instead of pots/knobs from the old V4. Clearly on this front Roland have been listening to their users, with the inputs now being BNC plugs on the rear of the unit with individual monitor outs and the faders being excellent quality. You can see that this is an evolution of the V4 design, which often caused problems with the top mounted RCA inputs and the Pots on the FX and White/Black fade needing to be replaced. A very well placed tweak to the White/Black output fade system means that – instead of having to keep the knob centered – we now get 100% signal on the fader all the way up and 100% white or black, selectable on a separate switch, with the fader all the way down. Also on the fading front, we have individual bus fades, so at the press of a button your FX fader becomes a video level for the channel, which combined with the new Mix modes I’ll cover later makes this a perfect scratch video tool. Other new functionality that offers a lot of creative scope is the ability to now assign FX and fades to the transform buttons, allowing you to jump to an effect or a fade level etc. with a tap of the Transform button. I found this very useful for presetting FX as they can be saved into the preset knob, really starting to get to the creative side of live FX use. Another area for artistic exploration is in the realm of transitions, I’ve never been a huge fan of tacky transitions (although I once saw a set made with nothing but static & an MX1 doing transitions that stunned me silly), but with the new custom transitions, you can build your own multi stage transitions from the building blocks provided. This will definitely have you looking at new ways to “create” with your mixer instead of just the old switch/layer/fade. People were pretty quick off the mark criticizing the original V4 for its lack of a proper additive mix mode like the MX-50, Roland saw to that with the new V8 and raised the bar with the inclusion of not only NAM (Non-Additive Mix) but FAM (Full Additive Mix). Basically, the difference between these two is that one mixes the signals together adding the luminance values of the pixels, the other actually selects which pixel to use based on brightness (or something similar). This description doesn’t really do it justice, as they are quite different effects. However, they are made even more useful by being able to use the BPM knob to adjust the fader crossover point on the fly, again a massive improvement over the older generation of mixers. Including a (or multiple) VGA input was always going to be controversial, with most people then complaining of no HD out, or why not two? In this area Roland have struck a balance, by including one excellent quality scan converter with a manual switch between the two VGA inputs has kept the cost down (but the functionality up). I was splashing up the VGA input on some rather large plasma screens and was very happy with the quality, and unlike the old V5, the VGA input features the adjustablity of a good scan converter, with full H&V positioning and size, flicker, etc. to ensure you don’t end up with any horrible black borders: which is very handy when even some current generation laptops still don’t properly support full overscan. So at least you can ditch the external scanny. Most of the other functionality is similar to the V4 with the addition of some new FX, etc. So the evolution continues without dropping any of the things we have come to rely on. Build quality is – like the V4 – top notch, with a very solid t-bar, and still with the great ability to rotate it 90 degrees (I also presume that the X fader mods will also work in this unit). The metal body construction felt even more sturdy than the V4. One small trade off for all those extra inputs is a small increase in depth of the unit and possibly the need for more space behind it for all the BNC plugs, but with most people using them outside of a case (or using a case that allows custom foam) its still alot smaller and solider than anything else on the market. An excellent next generation to a classic, definitely a great addition to any VJ’s kit; especially those looking to expand not only creatively, but input wise. Thanks MoRpH! Some great news there, and it’s fantastic to get information gleaned from real-world use rather than just reading marketing materials. Has anyone else been able to spend some quality time with the V8 since release? Feeling that you might upgrade from your old trusty V4 to get those new blend modes? Hit us in the comments.